The Bay Area has been host to so many films that it has been known at times as Hollywood North. More than 600 movies — from blockbuster features to lesser-known indies — have been filmed here since 1927, when talkies made their debut. And frequently, Pacific Heights is the neighborhood of choice — even though the 20th Century Fox movie Pacific Heights (1990) was filmed on Potrero Hill, with its sweeping vistas of the city. Perhaps the most memorable local movie site is the Mrs. Doubtfire (1993) house at 2640 Steiner Street. While the interiors were actually shot in a Richmond warehouse, exterior scenes were shot at Steiner and Broadway. 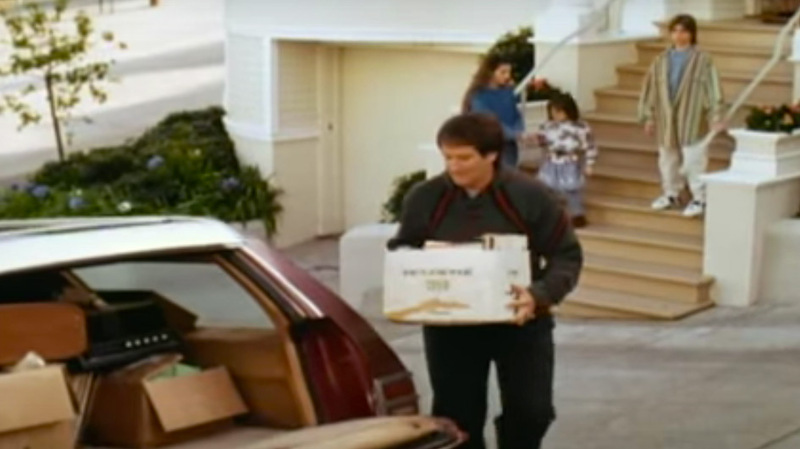 The house was in the news again last year when two fires were set — ironic, given the memorable kitchen fire scene with Robin Williams starring as Mrs. Doubtfire. Robin Williams starred as Mrs. Doubtfire, with exteriors shot at Broadway and Steiner. 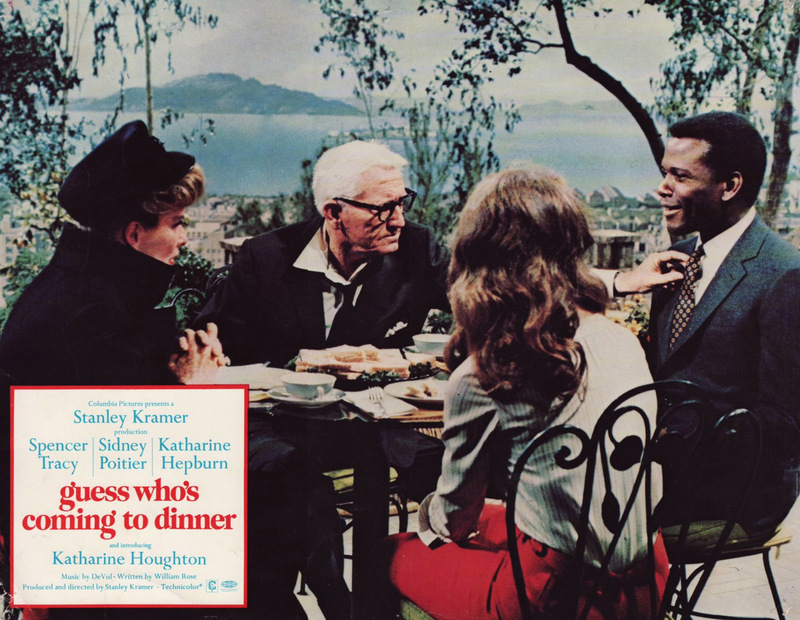 Another favorite film with local roots is the classic Guess Who’s Coming to Dinner (1967), starring Katharine Hepburn and Spencer Tracy. 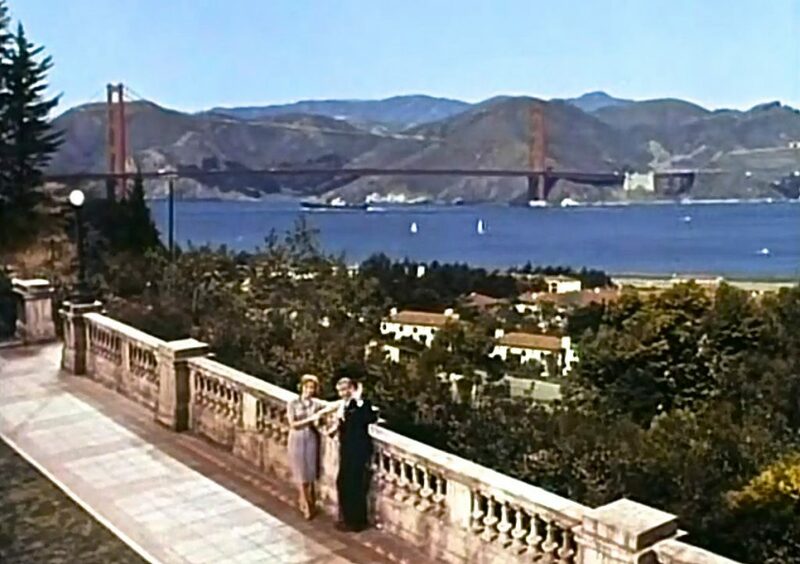 Pivotal scenes take place on their terrace, with a spectacular view of the bay, but those scenes were filmed before a backdrop on a soundstage in Hollywood. There is a location shot, however, of the intersection of Broadway and Normandie Terrace. 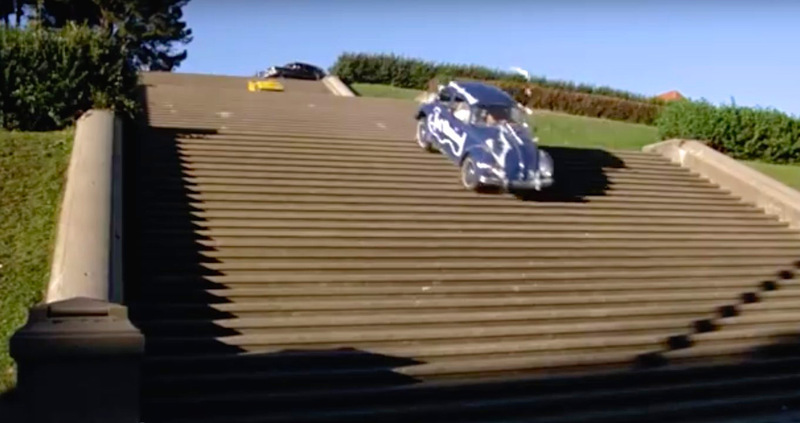 THE MOST FREQUENTLY FILMED LOCATION in the neighborhood is Alta Plaza Park, with its graphically stepped south-facing pyramid form. Although an Edwardian creation, film studios did not discover the plaza until 1972 when What’s Up Doc? with Barbra Streisand and Ryan O’Neal played out on the concrete steps and cars came careening down the grand staircase toward Clay Street, leaving damage that remains today. Future Mayor Dianne Feinstein was reportedly furious about the incident, as the city was not informed this dangerous event was to take place. The film commission now monitors the actions of all shoots. 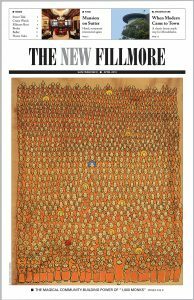 Other movies with scenes filmed at Alta Plaza include Francis Ford Coppola’s The Conversation (1974), Copycat (1995), Flash (1981), Thief of Hearts (1984), Little City (1997) and Nine Months (1995), directed by neighborhood resident Christopher Columbus, who then lived on the park. Scars from the filming of What’s Up Doc? 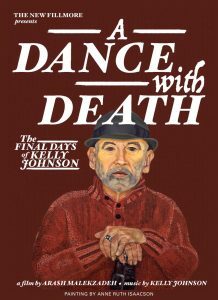 at Alta Plaza Park remain today. The neighborhood also hosts many sacred places of different faiths, some of which have been seen in movies. In the opening sequence of That Brennan Girl (1946), Calvary Presbyterian Church at 2515 Fillmore Street is shown with other local houses of worship. A brief scene in Die Laughing (1980) shows Congregation Sherith Israel at California and Webster. Another shows young women from the post-high school Vietnam War era scrambling across the roof of the brick neo-Gothic Macedonia Baptist Church at 2135 Sutter Street. They are sneaking into a Fillmore-esque psychedelic scene in More American Graffiti (1979); the original top of the tower at St. Dominic’s Church, removed after the 1989 Loma Prieta Earthquake, can be seen in the distance. A fortunate unintended benefit of the cinema is that it has recorded vanished times and places. In some cases, these are the only preserved images and give a three-dimensional view. It’s no accident that some buildings that play a part in movies were demolished soon after they were filmed. Filmmakers gravitate to vacant buildings as blank canvasses that allow them to fill in whatever the script requires without interference from occupants. One example is the 42-room mansion from the high Victorian era, once the residence of newspaper titan Michael de Young, at 1919 California Street. The comedy mystery movie filmed there, After the Thin Man (1936), starred William Powell and Myrna Loy. Today the only remnant of that property is a stanchion, much altered and part of the Tobin residence, which de Young built for his daughter Constance and her husband, Joseph Tobin. After the Thin Man was filmed at the de Young Mansion at 1919 California Street. A 12-story apartment building dating from 1961 now stands on the northeast corner of the intersection of Washington and Laguna Streets. Earlier, the Dr. William G. Irwin mansion stood on that spot, and was seen in Fog Over Frisco (1934). The residence was built in 1899, and after Irwin’s death in 1914 housed the country’s first blood repository, becoming the Irwin Memorial Blood Bank in 1941. The original building was demolished in 1960. Both Treasure of Monte Cristo (1949) and later Hell on Frisco Bay (1955) show the towering Victorian William Martin residence on the southwest corner of the intersection of Franklin and Jackson Streets. That gem, which had a tower with a belvedere, was replaced in 1955 with a stucco-clad multi-family building — another example of a doomed, vacant building used in the movies. The 10-story apartment building constructed in 1960 at 1800 Pacific Avenue was used as the home of the alcoholic couple played by Jack Lemmon and Lee Remick in Days of Wine and Roses (1962). But don’t go looking for the building you see in the movie; its facade was updated a few years ago. THE LAST OF ALFRED HITCHCOCK’S 49 films, Family Plot (1976), primarily focuses on the residential building on the northeast corner of the intersection of Sacramento and Buchanan Streets, where a treasure hides in plain sight. Steve McQueen roars all over the city in Bullitt (1968), including a scene on Fillmore between Broadway and Vallejo Street. Foul Play (1978) takes place throughout the city, although a non-resident would not know, given the way the film was put together. Cop Tony Carlson (Chevy Chase) commandeers a cab with Gloria Mundy (Goldie Hawn), continuing their quest to get to the San Francisco Opera House to prevent the pope (played by San Franciscan Cyril Magnin) from being assassinated. They pass the southwest corner of Laguna and Sutter Streets, where the Soto Zen Buddhism International Center sits today, offering a glimpse of a service station that once stood on that corner. After going through Japantown, the car speeds alongside Lafayette Park on Laguna Street. 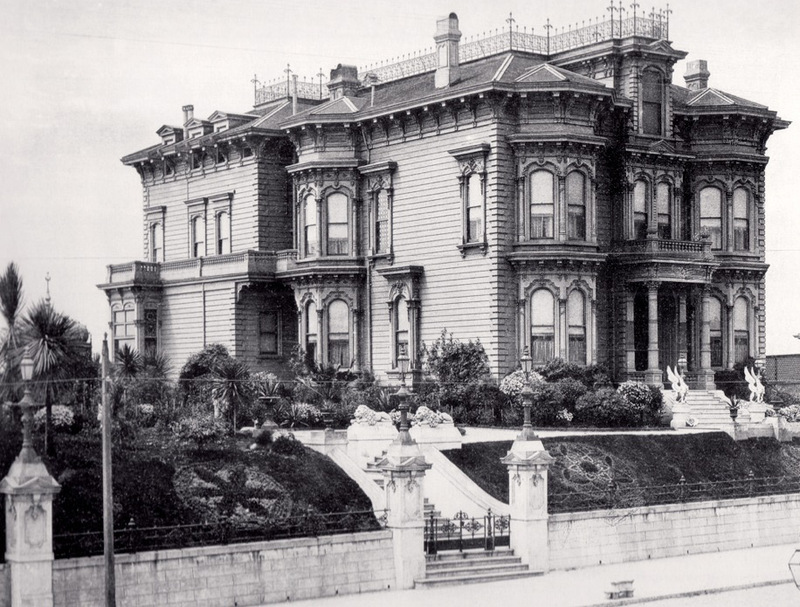 The imposing 2700 Vallejo Street residence, at the intersection of Divisadero, was built in 1915 for Captain F. Olsen to the design of architect C. O. Clausen and currently is the residence of the consulate general of Japan. The mansion appeared in Where Love Has Gone (1964), Bullitt (1968) and The Towering Inferno (1974). The rear facade has no space for the romantic garden shown in The Pleasure of His Company (1961), so a set was modeled on the property two blocks away at the Lyon Street steps. Scenes in The Pleasure of His Company were modeled on the Lyon Street steps. Alma de Bretteville Spreckels’ grand classical mansion at 2080 Washington Street was first seen in The Man Who Cheated Himself (1950), where the scheming Jane Wyatt and Lee J. Cobb are sitting across the street in Lafayette Park with the mansion and bay in the background. The building appeared again in The Sniper (1952), the scene of a prominent socialite’s murder. But probably the most memorable appearance of the grand dame of San Francisco mansions was in the musical Pal Joey (1957) with Rita Hayworth, Frank Sinatra and Kim Novak, with the house masquerading as the nightclub Chez Joey. The next year, the Cary Grant film In Love and War (1958) used the property, followed by Susan Slade (1961). The year after Alma Spreckels died, the mansion appeared in Eye of the Cat (1969), a feline phobic thriller. FILLMORE STREET’S PICTURESQUE STREETSCAPE has not often been used in movies, perhaps because it is too busy, but it has appeared in a couple of films. The stark taxi-centric story of Rob Nilsson’s Signal 7 (1983) features cameo appearances of the exterior and marquee of the Clay Theatre at 2261 Fillmore Street. 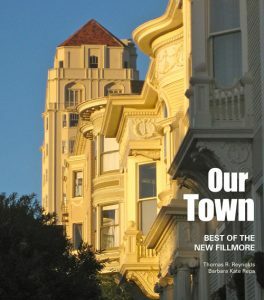 The Indian-produced Asperger’s Syndrome-based story My Name is Kahn (2010) includes scenes next door of the interior and exterior of the de Pietro Todd Salon at 2239 Fillmore Street. A few blocks away at 2413-17 Franklin Street is a Mannerist-Baroque take on a French-inspired Victorian designed by self-taught architect James F. Dunn, who designed a couple of other similar buildings in the city. It was seen in An Eye for an Eye (1981) with Chuck Norris and Christopher Lee, and used as the site of a high-end house of prostitution. The French-inspired Victorian at 2413-17 Franklin Street was used as the site of a high-end house of prostitution in An Eye for an Eye. Femme fatale Lana Turner’s residence in Portrait in Black (1960) at 2898 Broadway is a neo-Georgian gambrel-roofed brick edifice, turned on end to show off the gable’s roof profile. The storyline echoed some real parts of Turner’s life, including when her daughter Cheryl Crane stabbed Turner’s lover Johnny Stompanato to death in 1958. One pivotal hair-raising scene at the end of the movie has the daughter escaping the villain via the roof. More recently, Woody Allen shot scenes there for Blue Jasmine (2013). 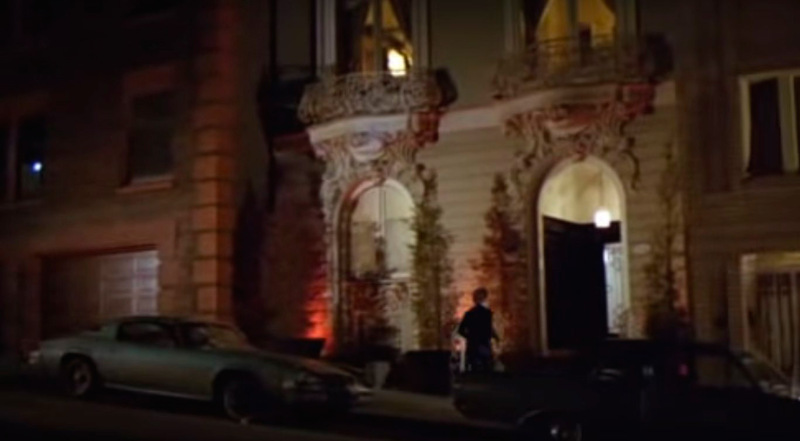 The Victorian headquarters of the nonprofit San Francisco Heritage, the Haas Lilienthal House at 2007 Franklin Street, was seen in Dying Young (1991). Filming of the movie also took place on the Lyon Street steps, as did the British production of Tales of the City (1993-94). In The Lineup (1958), the head of the San Francisco Opera (played by native San Franciscan Raymond Bailey, better known to TV audiences as Milburn Drysdale in The Beverly Hillbillies), who has just returned from a trip abroad, resides in the red sandstone Whittier mansion at 2090 Jackson Street. Its wood-paneled interior is the scene of a scam to import heroin in hollow flatware handles, unbeknownst to the just-returned traveler. Sudden Fear (1952), the black-and-white noir thriller with Joan Crawford as heiress Myra Hudson and Jack Palance at his creepiest best, features 2800 Scott Street on the northeast corner of the intersection with Green Street. Mr. Ricco (1975), with rat packer Dean Martin, shows 2229 Divisadero Street on the south slope of Pacific Heights. The two Victorian houses are the former residence of architect Julia Morgan, who lived in the Italianate building with her mother. 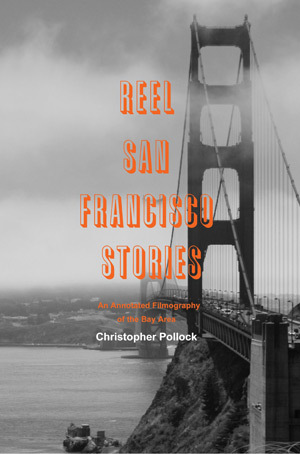 The information in this article is adapted from Christopher Pollock’s Reel San Francisco Stories: An Annotated Filmography of the Bay Area, published by Castor & Pollux.